Mass production of recordings with a practical and economic manufacturing process prior to Eldridge Johnson's manufacturing innovations was not feasible. In the case of cylinder recordings, a practical method to manufacture copies was not developed until 1902 1. 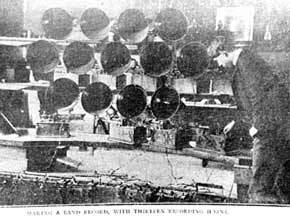 Mass duplication of cylinders, whether by Edison or by Bell - Tainter was done by recording cylinders on as many as fifteen recording horns, simultaneously for a band, or perhaps four or five horns simultaneously for a singer. Repeating these multiple recordings again and again must have been exhausting, and even so, would not produce a large number of cylinders to sell. Berliner's acid etching of a zinc master disk made reproduction of multiple copies of a single recording much more practical, but only a few stampers could be made from one master. Also the recording, cleaning, acid etching, removal of wax, and the problem of acid etching surfaces other than the recording groves, resulted in a difficult process, and a relatively high surface noise of the resulting recording. Based on manufacturing cost and manufacturing reliability, none of the initial Edison, Bell - Tainter or Berliner systems were the basis for the expansion of phonograph sales. Johnson's wax disk master electroplating method, the making multiple mother pressing disks, and the mass production of reliable shellac disk pressings changed all this. Victor recording had good volume and relatively quiet surfaces and provided the public with the product they could welcome. All this was done at a controlled and economic manufacturing cost, with a robust process. After the recording was cut onto the wax master, it was necessary to make multiple metal stampers which could reproduce the original recording. A wax master was too fragile for multiple playings, and in any case, metal stampers were necessary to produce thousands, or even hundreds of thousands of duplicate records. Production of metal stampers from the wax master was done by electroplating the wax surface. For this to be possible, it was necessary to make the wax surface conductive. With the Eldridge Johnson process, this was done by brushing a conductive powder on the wax surface with a fine brush. Initially, lead dust as used, and later copper dust was employed in the first few years. Very fine and pure graphite powder was eventually identified as being superior and cheaper than the metal powder for making the wax surface conductive. Bell Laboratories in the 1930s developed a method of sputtering a one molecular layer of gold on the surface of a wax master to make it conductive without adding to disk surface noise, as did the brushing of metal or graphite powder on the groove surface. The coated wax master was then submerged in a electroplating bath. This bath was a solution of copper sulfate and sulfuric acid. An electrical charge was attached to the wax surface, now conductive due to the graphite, which became the cathode of the electrical circuit. The other pole of the electrical circuit, the anode, was located somewhere in the electroplating bath. Gradually, as a function of the amperage of the electrical circuit and the concentration of the metal in the electroplating solution, the electroplating of the wax master would build up a layer of metal on the wax surface. In the case of the copper sulfate bath, this would be a copper layer. This layer would exactly match the recorded groves in the wax master. In early years, this could take many hours, but with later process improvements, a useable copper layer could be produced overnight. This wax master, with its electroplated metal layer was then placed in a large lathe, where the edge was carefully cut down until the separation between the original was master and the copper layer could be seen. The copper layer was then stripped from the wax. This copper layer was a negative image of the wax master, with the grooves raised up from the surface, rather than being down into the wax. This negative image could then be further reinforced with a light electroplating of a harder metal, usually nickel. In later years, the nickel would be further reinforced by a further light electroplating of chromium. This negative image could become a “stamper” or “Stamping matrix” to stamp the grooves into a shellac record, under high temperature (usually steam heat) and pressure. However, usually it was not, since to produce many thousands of disks, multiple stampers would be necessary. Rather, the copper negative image would be used to make multiple new stampers. First, the copper negative, after being stripped from the wax master would be carefully polished to produce a perfect copper surface, without affecting the recorded ridges which were the negative of the recorded grooves of the master. It would be rinsed and treated multiple times to remove oils and residues. The copper negative might then be silver coated. In later years, this silver coating might be applied by a sprayed silver solution. In earlier years, this polished copper negative, or the copper negative with a slight silvering was covered by a semi-liquid compound of various materials, depending on the manufacturer. Typically, these were combinations of very fine plaster of Paris, wax and other compounds. This semi-liquid compound was poured over the copper negative image of the master and allowed to dry and harden. This could be done multiple times, each time producing a new identical image of the original wax master. This was done prior to the 1920s. In later years, the copper negative, often covered with a molecular layer of silver would again be electroplated. The result copper electroplated layer, called a "mother" could be separated from the copper negative, and would be functionally identical to the wax master. However, since it was conductive, did not require metallic or graphite dust to be applied to its surface. This new metal master could be used to produce multiple stampers, using the same process described above. These multiple metal stampers were then bonded to a rigid backing to make a strong metal stamper. These would be placed in the stamping machine, with a paper label and a small brick or ball of the shellac record material, and with great heat and pressure, a shellac disk would be "pressed". Record companies retained the metal masters, often for years, to produce more stampers if necessary. Most companies also kept the original wax masters from other recording ‘takes’, at least for a time in case something happened to the original master or to the copies of the masters. These back-up wax masters also could be used to make new stampers in the case of any problem. These techniques, first developed by Eldridge Johnson and further improved by the Victor Talking Machine Company and its competitors allowed for the first time tens and hundreds of thousands of shellac disks to be stamped from multiple stampers made from multiple copies of the original wax master. These techniques, with improvements were used not only for the acoustic recordings of about 1901 to 1925, but also during the electric recording era of 78 RPM recordings. Beardsley, Roger. Waxes, Shells and Stampers. Centre for the History and Analysis of Recorded Music (CHARM). Kasakove, Paul B. Edison Diamond Disc Records (Hill and Dale) Manufacturing Processes as of 1920 to 1929 from Wax Masters to Condensite Records. July 1964. Reproduced from the Edison National Historic Site archives, West Orange, NJ on the Mainspring Press website. >Notebooks by Edison and Other Experimenters - Disc Plating Experiments: (NA337A) on disk electroplating at Edison from June 1920 - March 1921 Notebooks, Thomas A. Edison Papers Project at Rutgers State University, Piscataway, NJ 08854. 78 RPM Record Production in the USA. 1937. Film featuring Duke Ellington. RCA Victor Record Manufacturing Process. 1942. RCA produced film with Milton Cross narrating. The song which is to be sold in the form of a phonograph disc record is first sung by an artist, the sound waves thus produced by the rendition of the song are collected by device and recorded on a revolving wax-like tablet known as a blank. This blank revolves on a turntable of approximately 80 revolutions per minute, and as the song is sung, the sound box attached to a very fine sapphire jewel known as a recording stylus, is let down in the surface of the wax tablet and cuts into the same and the vibrations of the sound are engraved in this tablet in the form of a spiral. The wax record thus made is called a wax master record. The wax master record is then prepared for electroplating by coating it with graphite, a metallic conducting surface. 3. The wax master record coated with graphite is placed in an electroplating bath and covered with a coating of copper. The copper shell, reproducing the recording on the is then stripped from the wax master. This is known as a copper master record. 4. The copper master record is then cleaned, silvered and waxed. 5. The copper master record thus coated is placed in an electro bath and a shell of copper is deposited thereon. This shell of copper is then stripped and represents a record that is in all respects the same as the original wax engraving. This is called a mother record. 6. The mother record is then silvered and prepared for an electro plating bath. 7. The mother record, coated with silver, is placed in an electro plating bath and a copper shell deposited thereon which when stripped is known as the working matrix, or a stamping matrix. 8. The copper stamper is then trimmed to size, a hole punched in the center, the surface prepared and then nickeled in order to prevent oxidation. 9. The nickel stamper is then placed in a press, a thermoplastic material, consisting of clay, shellac, lamp black and flock (ground cloth), is placed on a steam table, the copper stamper is sweated into a die, and that is also placed on the steam table. The plastic material is then brought together with the stamper under great pressure and flows into the lines of the record, after which it is chilled and separated.